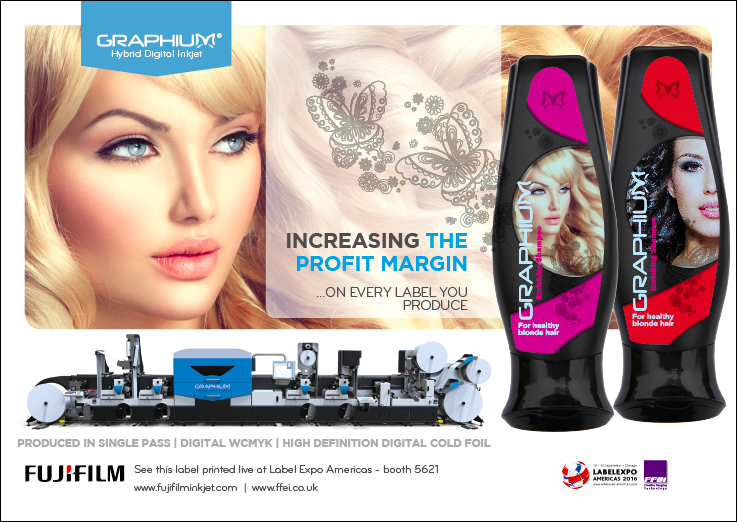 In Issue 4 of Labels & Labeling magazine, you will find an insert produced on a Graphium hybrid digital inkjet label press with digital finishing. The components and embellishments used within the insert are a true example of what is possible with a digital hybrid production system. We purposely made it a challenging brief. A full page insert that would sit upon and therefore interact with an advertisement sitting underneath. The insert incorporates a number of processes to catch the eye of readers flicking through Labels & Labeling and demonstrates just what is possible with a Graphium hybrid press – in a single pass. 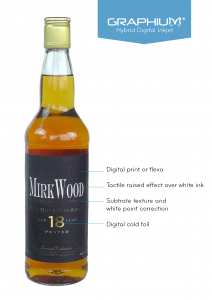 It’s well known that finishing and embellishment provide the added value that separates labels from printed graphics. Creativity and innovation in this area can mean the difference between success or failure for a brand marketing campaign, so when converters can offer new enhancements to clients it can help them win business with the brands. The practice of hybrid printing, combining digital and flexo print technologies in a single pass, has now become well established as a way to maximise efficiency and productivity. However the finishing aspects including ‘embellishment’ is an area that has long been dominated by the more traditional non-digital methods. This is all changing with the advent of new inkjet products and solutions. A number of technologies are emerging, which make finishing and embellishment for both digital presses and digitally controlled fixed colour flexo presses much more efficient, and provide entirely new possibilities for brand owners. For offline finishing we already see a number of highly automated systems starting to be integrated as inline, offering varnish coating, cold foil, die cutting, slitting etc. The embellishments they offer are usually post press orientated but currently rely on the automation and optimisation of traditional technologies. One solution being offered is the Graphium hybrid digital inkjet label press combined with the Xaar digital print bar, which enables both pre-print and post print digital finishing and embellishments to be achieved in a single pass. The Xaar digital print bar, allows mono inkjet printing using white, black and clear UV inks and can be tuned by print head selection for resolution, speed and ink laydown. To truly explore new and innovative possibilities however, a flexible print order is required. It is essential to be able to interleave digital and traditional technologies. The Graphium system enables this by allowing the Xaar digital print bar to reside anywhere on Graphium’s rail system. Convertors then have the option to add digital printing at any position on the web, whether it be in front of the main print engine or as a post print process. Graphium can then route the web in different ways in order to interleave the print bar in between Flexo’s. When used in combination with Graphium’s options, a wide spectrum of print finishes can be achieved. These include back printing, rotary screen emulation, textures, tactile control, specular control, metallics and other foil effects and a wide range of cutting and converting options. Back printing of labels is becoming increasingly popular by brands, as it reduces the typographic content on a label face side thus maximising the look and feel of the brand. To achieve this digitally a black or white print bar or flexo, mounted before the main digital unit with a Turnbar, can be used. For self-adhesive stock, a delam/relam unit can allow glue side printing. To truly emulate the effect of rotary silk screen and achieve the high opacity levels, the utilisation of large drop heads such as Xaar 1003 GS12 provides improved coverage at high speed and are less prone to nozzle outs at high coverage – allowing 1000’s of feet of error free print. Digital inkjet white is now capable of running at the same speed and with the same opacity and ink order positions as rotary screen, yet still provides resolution capable of the finest details at the same time. A true replacement technology, which completely eliminates the setup cost and setup time of screen. Large drop grayscale heads are not restricted to just white ink, both clear and white inks can be used to create tactile effects. The advantage of using white ink to create textures is that it can be used in combination with digital CMYK printing and varnishes allowing anything from matt to high gloss to be consistently achieved. We are seeing the use of bump maps similar to those used in 3D rendering to achieve modelling of the inks topography. This allows the emulation of a micro embossed paper, like a wine stock, using a very low cost paper. Careful selection of flood varnish allows the matt effect to be retained like a primed media. This is also used to overcome printability issues with highly absorbent uncoated media. Substrate emulation can also incorporate colour similar to a proofing solution. The biggest benefit is that although there is a higher ink cost, the combination of ink and substrate can be less than sourcing bespoke or specialised media. Using clear inks allows the tactile effect to provide a contrast in reflectance from matt to gloss. The amount of gloss varnish used can actually be controlled through the grayscale capabilities of the head. This can be taken to extremes with a head like Xaar 1003 GS40 whilst still printing at high speeds. The higher volume and fine detail that can be achieved with UV clear ink makes it also ideal as a cold foil adhesive. With the print bar positioned next to a lamination unwind/rewind and routed through the pressurised and UV curing system digital cold foiling becomes an practical solution. Both API and Kurz foil have been seen to give good results, which can be seen in this issues Graphium label insert. One of the benefits of this approach is that controlling the ink volume digitally and energy of the pre and post nip cure, allows a vastly improved tear off and adhesion compared to traditional cold foil. Actually UV inkjet cold foil is much closer to the effect of hot foil in terms of edge quality. When this is used in combination with a secondary clear ink even hot foil type embossed effects are possible at short run, quick turnaround. Now cold foil is possible digitally at high speeds other factors such as holographic content and variable data can come into the digital domain. The industry is only just scratching the surface of what is possible in terms of security and brand protection with this type of technology. Prints and embellishments, achieved in a totally digital way, still need to be die-cut efficiently. One technology that is evolving fast is laser, which is now capable of some of the most intricate and accurate die-cutting around. But being heat based is not suitable for many of the materials favoured by the label market. For this reason magnetic die based solutions still produce the highest quality cut and reign as the workhorse of the label market. There are several key innovations, which make magnetic die more suitable to the digital market. Like on the Graphium system, which now offers an automated die station. This allows both full and semi rotary operation but is capable of removing a die and loading and setup of the next in seconds without need of cartridges or slide our cylinders. The system automatically locks into register. The waste matrix is break free allowing more intricate designs at higher speed. Finally, dual rewinds and slitting finish the process. The slitting is auto-setup using production data from workflow and can be recalled at any time. All of these developments means that future embellishment and die-cutting can all be digitally centric, adding to the overall benefits offered from digital hybrid printing solutions. 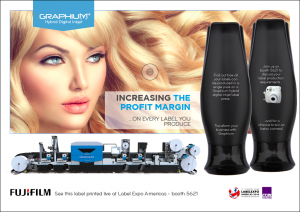 The above Graphium hybrid configuration will be demonstrated at this September’s Label Expo Americas show on Fujifilm’s booth – 5621. A wide range of labels will be printed live at the show, on a wide range of substrates, with digital finishing. Stop by and find out how all your labels can be produced in a single pass on a Graphium hybrid digital inkjet label press – you will also gain the chance to win a Fujifilm Instax camera!